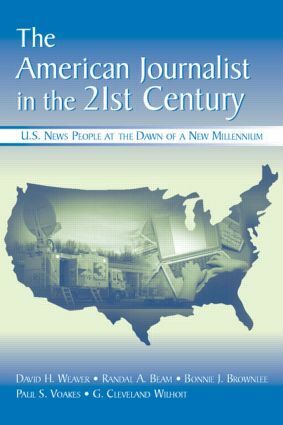 An authoritative and detailed illustration of the state of journalistic practice in the United States today, The American Journalist in the 21st Century sheds light on the demographic and educational backgrounds, working conditions, and professional and ethical values of print, broadcast, and Internet journalists at the beginning of the 21st century. Providing results from telephone surveys of nearly 1,500 U.S. journalists working in a variety of media outlets, this volume updates the findings published in the earlier report, The American Journalist in the 1990s, and reflects the continued evolution of journalistic practice and professionalism. The scope of material included here is extensive and inclusive, representing numerous facets of journalistic practice and professionalism, and featuring separate analyses for women, minority, and online journalists. Many findings are set in context and compared with previous major studies of U.S. journalists conducted in the 1970s, 80s, and 90s. Serving as a detailed snapshot of current journalistic practice, The American Journalist in the 21st Century offers an intriguing and enlightening profile of professional journalists today, and it will be of great interest and value to working journalists, journalism educators, media managers, journalism students, and others seeking insights into the current state of the journalism profession.